PRESS RELEASE: Overloud is proud to announce the release of SpringAge, the new reference in spring reverb simulation. Based on a mixed convolution and algorithmic technology, Overloud SpringAge can give the advantages of the two worlds. If you have never been able to get the real tone and dynamic of a spring reverb out of a plug-in, then you need to check it out. 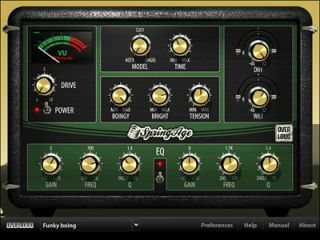 With three spring models, taken from the most standard and acclaimed vintage and modern gears, SpringAge always gives the perfect tone on any kind of instrument, ranging from guitars to vocals, keyboards and synthesizer. SpringAge is available as a plug-in in VST, RTAS and AU formats for Mac OS X 10.5 or higher and Windows XP or higher. Both 32-bit and 64-bit versions are natively available. It is currently shipping (list price 79 EUR) and available for download from the Overloud website.